I've posted before on how I got my hair red, but looking back on it, I realize how much brighter my hair is now! A subscriber asked me to show how I actually do it so I decided to film a tutorial for those of you who are considering dying your hair red. In this first video, I explain how I got my hair from a dyed dark brown colour to a medium red shade & includes all the products I used. I had this colour for about 3 months & then I decided to go brighter. 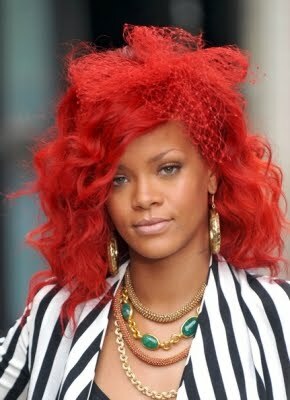 So I bleached my hair again and then I used the Revlon Nutri Color Creme to get the bright 'Rihanna Red'. This video explains how I do it, along with a quick demo of how I touch up my roots. But for me, I am a big fan of Holly Hagan from Geordie Shore & I love her hair! Oh poor Holly...but it's the only photo I can find where her hair is that shade of red! Let me warn you, this hair colour is high maintanence & would need to be done fully about once a month with a few top ups in between! Red hair fades like none other! Unforunally i cant watch the videos.. can you tell me what products you used in your first video? I love love LOVE that colour!